Weekend Historical Happenings: 9/29/12 - 9/30/12 ~ The History Girl! On Saturday between 11:00 am and 4:00 pm, Mount Tabor, an historic Victorian Camp Meeting community, showcases 15 Victorian cottages and historic buildings on a self-guided walking tour. Box lunches will be available for sale. Visitors park at the Mount Tabor Elementary School on Park Road, located a half mile south off Route 53. (Use this address for online maps or GPS: 864 Park Rd Morris Plains, NJ). A shuttle will run continuously to Mount Tabor from 10:30 am - 4:30 pm. Proceeds of the tour fund building restoration, educational programs, and beautification projects in Mount Tabor. This event is sponsored by the Mount Tabor Historical Society and will be held rain or shine. On the day of the tour tickets are sold at the gazebo ($20.00) on Simpson Avenue, near the Tabernacle or at the end of the shuttle line. For additional information and/or advance tickets, call 973-586-1564 or see the House Tour flyer at www.mounttabornj.org. Enjoy this annual Lacey festival featuring an apple pie contest, Victorian games, crafts, demonstrations, music, and food. While there is no charge to attend, some activities require tickets (50 cents each). The festival will be held at the Lacey School House Museum between 10:00 and 3:00 pm and sponsored by the Lacey Historical Society. The Lacey Historical Society seeks to preserve artifacts, landmarks, and lore of the local region so that public awareness of and appreciative concern for the unique history of Lacey Township may be fostered. The museum headquarters is Forked River's old schoolhouse, built in 1868 and in use until 1952 - when a new grade school was built. The museum is located at 126 South Main Street (Route 9), Forked River, NJ 08731. For more information call 609-971-0467. The Princeton Battlefield Society invites you to its September 29th Community Event at the Princeton Battlefield (Mercer Road). A full day of activities (10:00 am to 4:00 pm) will include a children's scavenger hunt, tours of the Clarke House and the Battlefield, a horseshoe challenge for kids, demonstrations of colonial chores, a used book sale, and Revolutionary War Demonstrations. At 4:00 pm join the Society for Colonial Music by John Burkhalter and the Practitioners of Music followed by "Cato a Tragedy" by Joseph Addison and performed by the Princeton Shakespeare Company. Cato was a favorite of George Washington who requested a performance during the encampment at Valley Forge. Feel free to bring blankets and folding chairs. This event is free but donations will be accepted. For more information visit www.theprincetonbattlefieldsociety.com for a full schedule and times. Whitesbog Preservation Trust will host a moonlight walk at Historic Whitesbog on Saturday at 7:00 pm. By the soft glow of moonlight, walk through the dark, mysterious pines, along white sugar sand roads, to the shimmering cranberry bogs. Native owls can be heard far off. The leader will offer stories of the people who built Whitesbog, the local "Piney" folk, and the more recent American immigrants, all of whom worked here to make it one of the most successful agricultural enterprises in New Jersey. Meet at the General Store at 7:00 pm. Guests should be prepared for a relatively vigorous walk, are encouraged to dress for the weather and bring anything that may be needed for your comfort, such as sturdy shoes, bug spray, and a flashlight. Light refreshments will be served after the walk. Inclement weather cancels. Fee is $5.00 per person. Reservations by Friday, September 28 are required: leave name, telephone number and number of people attending on main voicemail, 609-893-4646, or email WhitesbogPreservationTrust@comcast.net. Visit www.whitesbog.org for more information about moonlight walks and other upcoming events. All proceeds benefit the Whitesbog Preservation Trust in its tireless efforts to restore and protect Historic Whitesbog Village and its surrounding lands. Whitesbog Village is located at mile marker 13 on County Route 530 in Browns Mills (Pemberton Township), NJ. The Historical Society of Stillwater Township's 7th Annual Fall Festival will be held on Saturday, September 29, 2012 from 11:00 am to 4:30 pm at the Stillwater Township School. It will feature hayrides, pumpkin picking, games, an apple pie contest and more. Live entertainment and refreshments will be available throughout the day. For more information contact Deborah at fallfestival@historicstillwater.org or call 908-698-4143. The Historical Society of Stillwater Township is a 501(c)(3) non-profit organization. It is the mission of HSST to foster and promote an interest in Stillwater area history through the education and preservation of family information, local cemetery records, artifacts, sites and structures and to maintain an historical and genealogical library and museum. Join the National Park Service and their partners as they host an asphalt art competition on Saturday from 10:00 am to 3:00 pm. 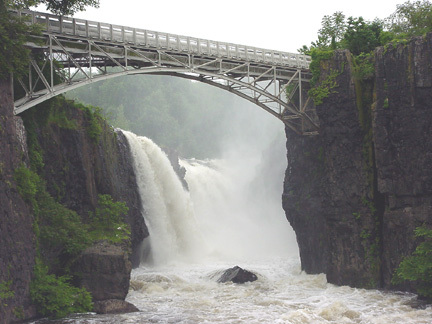 The competition will be held at America’s newest national park, Paterson Great Falls National Historical Park, at 72 McBride Avenue in Paterson. The purpose of the competition is to draw attention to the new national park and use art to interpret the natural, historic and cultural resources of the park. Each artist will be given their own asphalt canvass and use their creativity to tell a visual story about the park. Carved by melting glaciers 16,000 years ago, the 77 foot-high falls inspired Alexander Hamilton, the first US Secretary of the Treasury and Paterson’s founder, to harness the power of the falls to drive manufacturing. The “raceway” system of canals and spillways built in Paterson in the early 1800s powered the city’s bustling mills and helped turn the United States into the world’s largest market economy. Author Linda Barth will be your guide as you explore America's third state, New Jersey on Saturday at 2:00 pm at the Hillsborough Public Library. Children and adults alike will enjoy discovering the Garden State's amazing places. Learn about our state's past history and present endeavors. Linda will also introduce her new book, "Hidden New Jersey." This program is being sponsored by the Friends of the Hillsborough Public Library. Attendees can register at www.sclsnj.org, or call 908 369-2200 ext 14. The Hillsborough Public Library is located at 379 South Branch Road, Hillsborough NJ. Support the Cumberland County Historical Society by attending the 41st Annual Greenwich Artisans' Faire & Marketplace on Saturday and Sunday at the Gibbon House. This year's festival features nine new crafters. The Gibbon House is located at 960 Ye Greate Street in Greenwich. Join the Tuckerton Seaport as they celebrate the 30th anniversary of the Decoy and Gunning show this weekend highlighting the culture of the area from 7:00 am to 5:00 pm each day! View demonstrations, contests, seminars, a decoy auction, crafters, carvers, vendors, food, refreshments, music, entertainment, sneakbox races, rubber duck races and a lot more! There will also be dock dog competitions as featured on ESPN. The event is held at Tip Seaman County Park and Tuckerton Seaport & Baymen's Museum. Admission is free. The Tuckerton Seaport & Baymen's Museum is located at 120 West Main Street, Tuckerton, NJ. For more information call 609-296-8868 or visit www.TuckertonSeaport.org. Historic Soldiers Weekend is a historical encampment, featuring re-enactors, and their equipment, from every American conflict, spanning from the French and Indian War to the Vietnam War. In some instances, both sides of the conflicts will be present, such as the Revolutionary War loyalists and "redcoats", Civil War confederate units, and WWII German infantry units. The re-enactment units will be camping out for the weekend at Historic Fort Mott, living as their ancestors did. An old-fashioned country fair reminiscent of the 1890s. It takes visitors back in time when neighbors gathered to accomplish work, harvest, and spend time socializing and enjoying each others company. It calls not only for the exhibition of the best products that have been grown and the best needlework that has been done in the community, but also for games, athletic contests and similar features of recreational or educational value. Experience old-fashioned fun as it was a century ago with wagon rides, games and live entertainment. See craft demonstrations that will inspire you to start a new hobby or career. Enter one of many competitions ranging from needlework to baked goods to homegrown vegetables. Each person entering in a competition will have a chance to win a prize ribbon. For further information, call 732-946-3758. Celebrate the 225th anniversary of the signing of the U.S. Constitution at the Historic Jersey City & Harsimus Cemetery from 1:00 pm to 7:00 pm on Sunday. Meet Your Elected Representatives, sign the Constitution, take photos with our "Founding Fathers," view exhibits, art crafts, walking tours of the cemetery and live local musical performances by Christina Alessi, Leaf Pile, Scott Wolfson & Other Heroes, Greg Greg Pocketful, The FAVE, Davey & the Trainwreck, GhostPal & friends. A $5.00 donation is asked to help the volunteers operate and preserve the historic cemetery. The Historic Jersey City & Harsimus Cemetery is located at 435 Newark Avenue, Jersey City. It is a 5 to 10 minute walk from either the Grove Street or the Journal Square PATH Stations. Please visit www.jerseycitycemetery.org or call 201-707-0738 or 973-204-9888 for more information. Enjoy a free concert featuring Blue Plate Special sponsored by Park Avenue Acura and "Annual Railroad Day" at the Maywood Station Museum located at 269 Maywood Avenue, Maywood, NJ on Sunday from 12:00 noon to 3:00 pm. This fall Macculloch Hall Historical Museum will exhibit some of its most popular pieces as well as many seldom-seen treasures that have been in storage. Vivid examples of the antique Oriental rug collection will be hung in the museum's first floor gallery, complemented by textbook examples of fine porcelain, silver, glass and furniture collected by museum founder, W. Parsons Todd. This is a special opportunity to see rarely exhibited treasures from the collection in the gallery and tour the rest of the museum to see many other pieces in period room settings. Included in the exhibit are over a dozen Oriental rugs from the museum's collection. The exhibit will also feature some documents from our country's founding heroes, including artifacts from George Washington, Dolley Madison, and others. The exhibit will also feature fine furniture, such as a walnut English armchair, circa 1720, which was the inspiration for the museum's logo with the ornate looping back and shell design. "A Fine Collection" has a perimeter layout that leaves the center of the room open for a series of speakers and musical programming that will take place in conjunction with the exhibit over the next several months. Programs in conjunction with the exhibit take place with music on the first Sunday at 4:30 pm and speakers on the third Sunday of the month November through June (no programs in January). Macculloch Hall Historical Museum preserves the history of the Macculloch-Miller families, the Morris area community, and the legacy of its founder W. Parsons Todd through its historic site, collections, exhibits, and educational and cultural programs. The museum is open to tour the house and view exhibits on Wednesdays, Thursdays & Sundays from 1 to 4 p.m. Adults $8; seniors & students $6; children 6 - 12 $4. Members and children under 5 are free. The last tickets for tours are sold at 3:00 p.m. For more information visit www.maccullochhall.org or call 973-538-2404 ext. 10. Macculloch Hall Historical Museum is located at 45 Macculloch Ave., Morristown, NJ 07960. Richard Hunter will present a brief lecture on Sunday at 2:00 pm to coincide with the recent opening of the exhibit on James Rhodes, a stoneware potter who was active in Trenton for ten years at the time of the American Revolution. Rhodes, whose output is known from the recovery of pottery assemblages from two recently excavated kiln sites in Trenton, is a mysterious figure: we do not know how he came to be in Trenton, where or when he was born, or where he learned his trade. The lecture will provide an introduction to the exhibit, explain the historical and archaeological background to Rhodes's pottery making activity in Trenton, and set Rhodes within the broader context of colonial American stoneware. From mid-September 2011 through late January 2013, the Trenton Museum Society is presenting an exhibit at Ellarslie, the Trenton City Museum, highlighting the stoneware pottery of James Rhodes, one of the few known American stoneware potters of the colonial period. In 2005, a second kiln was found a mile from the first in the backyard of the Eagle Tavern property on South Broad Street during the city's restoration of this local landmark. Hundreds more sherds were recovered. Research into documents and analysis of the artifacts established a link between the two sites. It is now believed that James Rhodes operated the waterfront kiln from 1774 until 1777, working for the prominent Philadelphia merchant, William Richards. Then, from 1778 until his death in 1784, Rhodes ran his own pottery-making business on a property adjoining the Eagle Tavern site (which later became part of the tavern property). Despite our knowledge of James Rhodes's activities over the ten-year period he was in Trenton, virtually nothing is known of his earlier life. The exhibit will explain the discovery of the kilns and the archival research, but will focus mostly on displaying the extraordinary variety of grey salt-glazed stoneware products made by James Rhodes. Many of the items on display are fragmentary, a result of their archaeological provenance. However, among the reassembled vessels, visitors can view plates, dishes, bowls, cups and saucers, tankards, jugs and pitchers, coffee pots, teapots and ointment pots, along with numerous pieces of kiln furniture. Rhodes employed some signature decorative motifs that distinguish his products from those of other potters - floral designs and rough geometric patterns, executed in naturalistic style in painted cobalt blue - but perhaps his most engaging trait was the quirky application of molded faces on to the shoulders of some of his jugs and pitchers. This exhibit is being curated by Richard Hunter, president of Hunter Research, Inc., a Trenton-based historical and archaeological consulting firm, and museum society board member; Rebecca White, Archaeological Laboratory Director, URS Corporation; and Nancy Hunter, formerly manager of Gallery 125 in downtown Trenton. For more information, contact the Trenton Museum Society at 609-989-1191 or tms@ellarslie.org.